Do you make your own bagels? 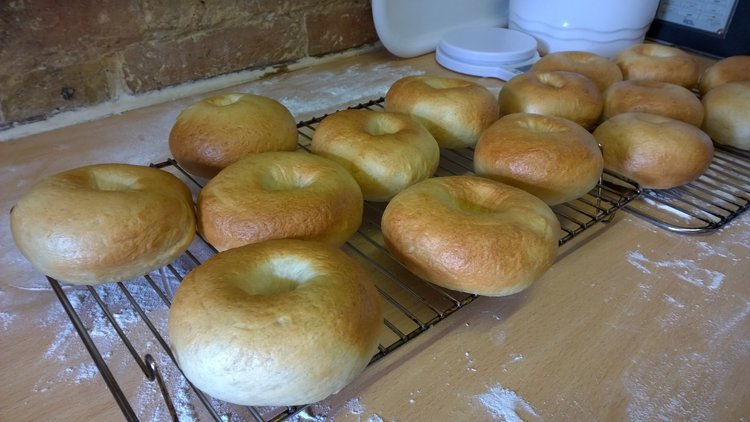 HAVE you ever made your own bagels? I hadn’t before, but wanted to have a go. I’m reasonably pleased with the result – the surface isn’t as smooth as I would like, and they are just a little too puffy, i.e. not quite as dense and chewy as they should be – I think this might all be down to over proving them but I’m no bagel science expert! The taste was right though and they were fun to make. The recipe I used came from: Mummy makes cakes. 1. Put the flour into a large bowl, then add the yeast and salt to opposite sides of the bowl. 2. Dissolve 2 tablespoons of sugar in the warm water then add the oil and mix well. Pour this into the flour bowl. 3. Mix until the liquid has combined with the dry ingredients to form a dough then knead either with a stand mixer and dough hook, or by hand, until the dough has a smooth texture. This will take about 10 minutes. I did mine by hand because I don’t have a mixer with dough hook. Add a bit more flour as the dough is kneaded, if you are kneading by hand you will be doing this on a floured surface anyway, so will work more flour in naturally. 4. Place the dough in an oiled bowl and cover with cling film. Leave to prove until doubled in size, about an hour. 5. 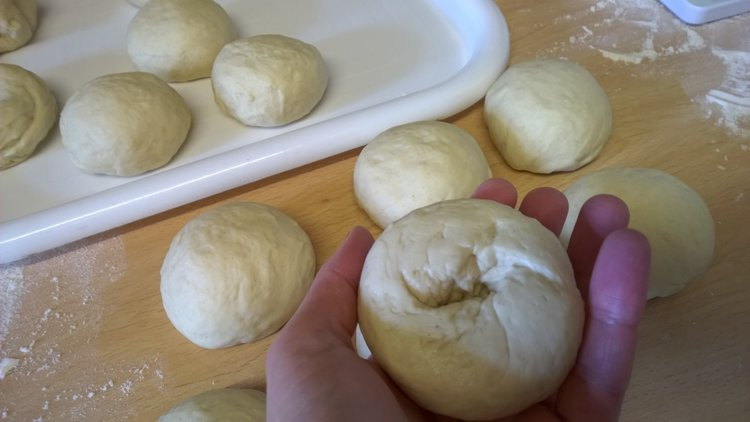 Punch the dough a few times to remove the air, knead lightly and divide into 15 pieces. Then all I had to do was continue pushing through the hole to take it all the way through, and then pull and stretch the ring out a bit wider because the holes close up somewhat during cooking. 7. Place the bagels on greased and floured baking trays covered with a cloth and leave to prove for a further half hour. 8. Add two tablespoons of sugar to a pan of water and bring to the boil. 9. Poach the bagels for 30 seconds on one side then turn them over and do 30 seconds on the other side. Remove from water with a slotted spoon and place on a clean kitchen towel to drain. I poached the bagels two at a time because of the need for fairly precise timing. 10. 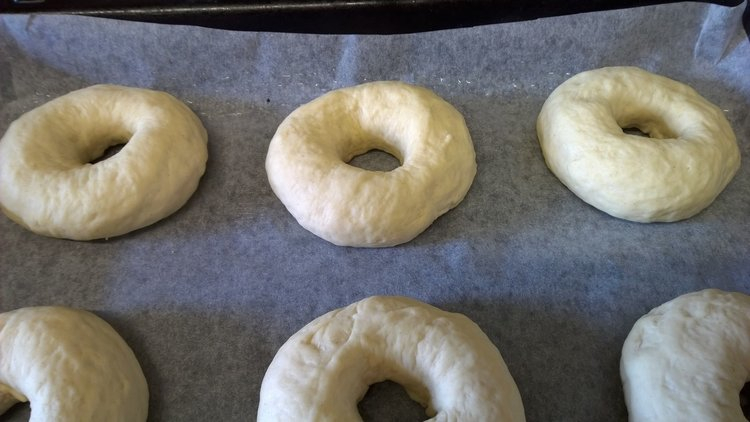 Once drained, place the bagels on the greased and floured baking trays and bake in a preheated 220c/430F oven for about 15 minutes, until golden. Serve toasted and spread with cream cheese – really, is there any other way worth bothering with? I l.o.v.e. bagels but gave them up because they sat heavy. Used to have one every morning at my work’s cafeteria. ❤ ❤ ❤ Mm. Mm. Good. Yes that’s the trouble with bagels, they don’t look huge but you’re actually getting a lot of dough in one, usuallly more than in a couple of slices of toast, so you’re eating more than you realise! Wow, you’ve REALLY impressed me now, Vanessa. I’ve never made them, but those look delicious. Yay! I’ve finally impressed Carrie! My work is done here 😉 I almost didn’t post them on here because of the lack of smoothness on the surface which was bothering me a little, but after doing a bit of Googling I realised this is common amongst home made ones, plus I’ve never felt that everything I post on here has to be perfect, it’s all about learning! I’m no expert in bagels either, but yours look great! I don’t put cream cheese on the ones I eat – I have them for breakfast with butter (or margarine) and jam! Also, I’m always interested in your terminology in the recipes. For example, you say a sachet of yeast, whereas in the USA we would say a packet of yeast. And is caster sugar the same as granulated sugar? I tend to switch about here with both terminology and measurements so sometimes they might be more American and sometimes British. Let’s hope the sachet/packets are the same size in both countries! Our standard ones are 7g – I should probably put that in the recipe. Caster sugar is more like superfine sugar, although from what I understand, US granulated sugar is finer than our UK granulated sugar anyway, so would probably be fine. I can’t believe you made bagels – that’s so goddess! I love bagels, but I have to be careful with them. Yours look delish! Yes, I tend to avoid having them too often, I’ll definitely make them again now though – might try some different types, although generally I prefer the plain ones anyway. Yes, there’s a lot of carbs in a bagel isn’t there! I make a lot of these things more out of wanting to try making them rather than wanting the end product!